A sensational exhibition by esteemed Indian painter Nilima Sheikh has just wrapped up at the Art Institute of Chicago. 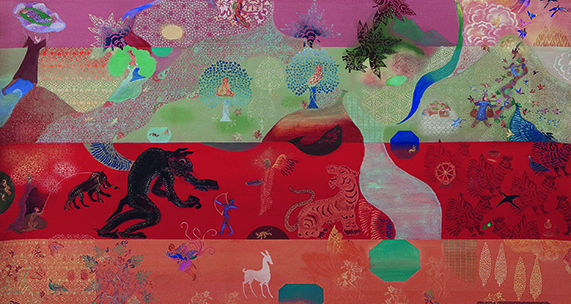 The exhibition, entitled “Each Night Put Kashmir in Your Dreams”, ran from March 8 – May 18, 2014. It consisted of eight varied scrolling paintings Ms. Sheikh created over the past decade, each of which served to juxtapose the tension and violence that characterises modern Kashmir with its uniquely “magical” historical past, all the while doting on its timeless cultural wealth. The poem “I See Kashmir from New Delhi at Midnight” by Kashmiri-American poet Agha Shahid Ali served as the inspiration for the exhibition’s title and content, as well provoking Ms. Sheikh’s initial foray into Kashmiri past and modern history. Excerpts from Mr. Ali’s poems can be found in the scrolls alongside a multitude of other inspirational texts, intertwined with sensuous glimpses of Persian miniatures and folkloric scenes. The pieces in this series echo themes seen in much of her work, which has recently focused on feminine subjectivity in history but which also places emphasis on controversial issues in South Asian culture. 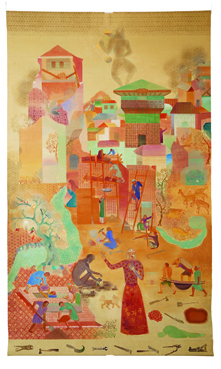 Ms. Sheikh was born in New Delhi in 1945 and obtained degrees in history and fine art; she also taught painting for a time before delving into her own artistic endeavours, which are all in painted form on various types of surfaces and often using traditional materials such as tempera and wasli paper. She has also worked on several theatre design and children’s book projects and has exhibited extensively, both in India and internationally. Ms. Sheikh does not appear to have her own website. For more information on the Art Institute of Chicago, please click here. To read Agha Shahid Ali’s poem “I See Kashmir from New Delhi at Midnight”, please click here. To read a review of “Each Night Put Kashmir in Your Dreams”, click here.